Australian Jan Latta is an author, wildlife photographer and publisher of 14 True to Life books which educate children about endangered animals. To create the books she follows animals in the wild to tell their story in photographs and in words. 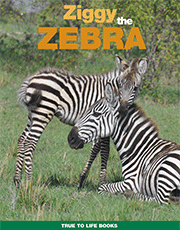 In her latest book, Jan introduces Ziggy, a Burchell zebra from the plains of Africa. With simple, large text font and clear, glossy photographs, the book tells (from Ziggy’s viewpoint), the story of the appearance of zebras on Earth three million years ago. We learn about Ziggy’s family, his appearance as a foal and zebras’ daily routines and habits. In the annual migration we learn, for instance, that mares lead the family group with other zebras following in single file. In the back of this 32 page book are helpful zebra facts. Of particular note are facts about zebra numbers, with fewer than 2,500 Grevy Zebras in the wild. There are also fascinating trivia facts, such as the zebra being a symbol of beauty in Africa. As well, in the back of this book, are animal art and craft activities for children, with a last page of interesting websites. In the past I have bought some of Jan’s animal books for children aged 5 to 8 years. They are good value and highly recommended. Jan is available for school presentations and workshops; see www.truetolifebooks.com.au for information and educational videos.